The stress-activated protein kinase p38 plays a central role in the regulation of cytokine biosynthesis by various cell types in response to a wide range of stimuli. Because the local inflammatory response and the infiltration of neutrophils is thought to contribute to the symptoms and sequelae of rhinovirus infection, we investigated the role of p38 kinase in cytokine and chemokine elaboration in airway epithelial cells infected with human rhinovirus. Rhinovirus-39 infection of BEAS-2B cells resulted in synthesis of cytokines (IL-1, IL-6, G-CSF, and GM-CSF) and CXC chemokines (IL-8, epithelial neutrophil-activating protein-78, and growth-related oncogene-α), evident 24–72 h postinfection. Rhinovirus infection induced a time- and dose-dependent increase in tyrosine phosphorylation of p38 kinase, which peaked 30 min postinfection and remained elevated for 1 h. Treatment of infected cells with SB 239063, a potent pyridinyl imidazole inhibitor of p38 kinase, resulted in up to 100% inhibition of mediator production and partially reduced levels of IL-8 mRNA as determined by quantitative RT-PCR. Treatment with SB 239063 had no effect on virus replication and was not cytotoxic at concentrations ≤ 70 μM. These studies provide the first evidence that early activation of p38 kinase by rhinovirus infection is a key event in regulation of virus-induced cytokine transcription, and may provide a new target for inhibition of symptoms and airway inflammation associated with rhinovirus infection. Human rhinovirus (HRV),3 the most frequent cause of the common cold, is increasingly associated with more serious sequelae including exacerbations of asthma, chronic bronchitis, chronic obstructive pulmonary disease, otitis media, and sinusitis (1, 2, 3). Recent studies in adults and adolescents using PCR to assist in viral detection have shown that up to 50–80% of asthma exacerbations are associated with upper respiratory tract virus infection, and that rhinovirus is the most common isolated virus (4, 5). Respiratory epithelium represents the primary site of replication for rhinovirus. However, only a small fraction of upper respiratory epithelial cells are demonstrably infected, and with minimal epithelial cell damage (6). It has been hypothesized that the symptoms associated with HRV infection are due primarily to the host response to infection rather than to an acute cytotoxic effect. In normal subjects, rhinovirus infection elicits local infiltration of neutrophils and intranasal production of many cytokines/chemokines including IL-8, IL-6, TNF-α, IFN-α, RANTES, GM-CSF, and IL-1, which peak during active virus replication (1, 7). Rhinoviruses, as well as other respiratory pathogens, have also been shown to stimulate production of IL-6, IL-8, and GM-CSF in cultures of primary respiratory epithelial cells or human epithelial cell lines such as BEAS-2B (8, 9, 10, 11) and to increase ICAM-1 expression (12, 13). Understanding the cell signaling pathways and factors leading to epithelial cell gene expression in response to rhinovirus infection may provide new therapeutic strategies for the treatment of inflammation associated with respiratory virus infections. The p38 kinase, a serine-threonine kinase, is a member of the mitogen-activated protein (MAP) kinase superfamily, which also includes extracellular signal-regulated kinase (ERK) and stress-activated protein kinase/c-Jun N-terminal kinase (JNK). The MAP kinases are important mediators of signal transduction, which regulate gene expression through a cascade of protein phosphorylation events, thereby inducing a variety of cellular responses such as apoptosis, proliferation, and cytokine biosynthesis. The p38 kinase is activated in a variety of cell types in response to hyperosmotic shock, growth factors, LPS, and proinflammatory cytokines and has been implicated in the downstream activation of multiple transcription factors such as activating transcription factor 2, Elk-1, C/EBP homologous protein, and cAMP response element binding protein (reviewed in Refs. 14 and 15). Inhibition of p38 kinase activity in various cell types with specific pharmacologic agents (pyridinyl imidazoles) has been shown to block production of inflammatory mediators such as IL-1, TNF, IL-6, IL-8, and GM-CSF through regulation of transcriptional and/or translational events (14). Several recent studies have suggested a role for p38 kinase in airway inflammation through induction of IL-8 expression in bronchial epithelial cells (16, 17). In this study we examined the role of the p38 kinase signal transduction pathway on cytokine and chemokine expression in a human bronchial epithelial cell line, BEAS-2B, in response to infection with rhinovirus. These studies have demonstrated that multiple CXC-chemokines (epithelial neutrophil-activating protein-78 (ENA-78), growth-related oncogene-α (GROα), and IL-8) and cytokines (G-CSF and GM-CSF) that are important in neutrophil activation and function are produced in response to rhinovirus infection. We present evidence that p38 kinase is rapidly phosphorylated in response to rhinovirus infection and that chemokine and cytokine biosynthesis is inhibited in the presence of pharmacological inhibitors of p38 kinase activity. Human bronchial epithelial cells (BEAS-2B passage 36; American Type Culture Collection, Manassas, VA) were cultured in collagen-coated culture flasks according to instructions provided using bronchial epithelial growth medium (BEGM; Clonetics, San Diego, CA) containing 0.5 ng/ml human recombinant epithelial growth factor, 5 μg/ml insulin, 0.5 μg/ml hydrocortisone, 0.5 μg/ml epinephrine, and 10 μg/ml transferrin. All experiments with BEAS-2B cells were performed using cells between passages 38 and 55. HeLa cell cultures (American Type Culture Collection), used for detection and titration of virus, were maintained in Eagle’s MEM supplemented with 10% FCS, 2 mM l-glutamine, and 10 mM HEPES buffer (MEM/10% FCS). Rhinovirus serotype 39 (HRV-39) was purchased from American Type Culture Collection. A stock solution of HRV-39 was prepared by infecting monolayer cultures of HeLa cells. Cultures were grown until cytopathic effect was >80% after which cells were harvested using a cell scraper to dislodge adherent cells, frozen at −70°C, thawed once, and pelleted through a 30% sucrose cushion by centrifugation for 2 h at 4°C at 25,000 rpm using a SW28 rotor in a Beckman Coulter (Fullerton, CA) L8–80 ultracentrifuge. The virus pellet was resuspended in BEGM medium and stored in aliquots at −70°C. Virus titers were determined by microtitration using HeLa cell monolayers, as described below. In some experiments, HRV-39 was inactivated by exposure to UV light and confirmed by microtitration on HeLa cells. Virus was irradiated in polypropylene containers at a solution depth of 1–2 mm. Irradation was performed for 20 min at a distance of 15 cm from a mercury germicidal lamp (Universal light source, G36T6L/CB) emitting at 254 nm. Detection of virus in BEAS-2B infected cultures or titration of virus stocks was performed by infecting HeLa cell monolayers (104 cells/well) in 96-well plates with 10-fold dilutions of virus-containing medium in MEM/10% FCS (6 replicates/dilution). Plates were incubated for 5 days at 34°C after which wells were scored positive or negative for cytopathic effect by microscopic examination. Calculation of tissue culture-infective dose (TCID50; amount of virus required to infect 50% of monolayers) was calculated according to the Spearman-Karber method. BEAS-2B cells (2 × 105 cells/well) were cultured in collagen-coated wells in 24-well plates for 24 h before infection with rhinovirus. HRV-39 was added to cell cultures at 2 × 105 TCID50/well (1 TCID50/cell) unless otherwise indicated. After 1 h incubation at 34°C, virus inoculum was aspirated and replaced with fresh media and incubation of cultures at 34°C was continued. Supernatants were collected at various times postinfection and stored at −70°C until assayed for cytokine protein concentration or virus yield. Two to four replicate cultures were set up for each treatment or time point, and replicates were pooled at time of harvest to provide sufficient sample to run multiple analyses. Cell-free supernatants from control or infected BEAS-2B cultures were harvested at various times postinfection, clarified by centrifugation (200 × g, 10 min) and stored at −70°C until assayed. Levels of cytokines in supernatants were determined by specific ELISA using commercially available kits according to manufacturer’s instructions (R&D Systems, Minneapolis, MN). The p38 kinase inhibitors, SB 239063 (trans-1-(4-hydroxycyclohexyl)-4-(4-fluorophenyl)-5-(2-methoxypyridimidin-4-yl)imidazole), SB 203580 (4-(4-fluorophenyl)-2-(4-methylsulfinylphenyl)-5-(4-pyridyl)imidazole), and the control compound SKF 106978 (2-(4-methylsulfinyl)-3-(4-(2-methylpyridyl))-6,7-dihydro(5H)pyrrolo(1,2-a)imidazole) were dissolved in DMSO to provide stock solutions (10 mM), which were stored at −20°C until use. Compounds were diluted to appropriate concentrations in medium and added to cultures 30 min before infection. After removal of virus inoculum from infected cultures, fresh compound was added with medium and remained for the duration of the culture. RNA was extracted from BEAS-2B cells infected with HRV-39, or control cells, using RNA-Stat60 (Tel-Test, Friendswood, TX) according to manufacturer’s instructions. Two to four replicate cultures were pooled for each treatment or time point tested. After drying, RNA was resuspended in diethyl pyrocarbonate-treated water and digested with RNase-free DNase I (GenHunter, Nashville, TN) for 30 min to degrade any trace amounts of genomic DNA, followed by a 5-min incubation at 75°C to inactivate the enzyme. cDNA was generated from 1 to 2 μg of total RNA using a GeneAmp RNA-PCR kit (Perkin-Elmer, Foster City, CA). For experiments measuring cytokine mRNA, the RT reaction (final volume, 20 μl) was conducted for 60 min at 42°C using oligo-dT and 0.5 uM/μl random hexamer primers. For detection of viral RNA, primers specific for either the positive-strand RNA or negative-strand RNA (designations OL27 and OL26, respectively) were used in the RT reaction (1 μg/μl). These primers are directed to a highly conserved 5′ noncoding region of the viral genome and have been described previously (18). The resulting cDNA was aliquoted and stored frozen at −70°C until use in PCR. Parallel reactions were routinely included, in which either primers or RT enzyme were excluded to control for nonspecific priming. Detection of cytokine mRNA was initially conducted using standard PCR amplification of cDNA templates generated in the RT reaction described above. Primer sets for each cytokine (Amplimer sets) were purchased from Clontech (Palo Alto, CA) and PCR conditions used were as recommended by the manufacturer. Detection of rhinovirus mRNA was also initially performed using standard RT-PCR. PCR was performed using primers introduced above (18). A PCR product of the expected size (380 bp) was detected in samples generated from RV39-infected cell RNA. RNA extracted from control uninfected cells or from cells infected with respiratory syncytial virus (RSV) did not produce any detectable PCR product at 380 bp confirming the specificity of the OL27/OL26 primer pair for detection of rhinovirus RNA (data not shown). Samples with positive PCR products of the expected size were further analyzed using quantitative real-time PCR. Reactions were performed in triplicate containing 2× Universal PCR Master Mix (Perkin-Elmer, Norwalk, CT), 1 μl of template cDNA, 200 nM of primers, and 100 nM of probe in a final volume of 50 μl, and were analyzed in Microamp optical 96-well plates (Perkin-Elmer). Primer pairs and probes described in Table I⇓ were designed using Primer Express software (Perkin-Elmer). Probes were synthesized by Synthegen (Houston, TX) to include a fluorescent reporter dye, FAM, on the 5′ end and labeled with a fluorescent quencher dye, TAMRA, on the 3′ end to allow direct detection of the PCR product. Reactions were amplified and quantitated using an ABI 7700 sequence detector and manufacturer’s software (Perkin-Elmer). Relative quantities were interpolated from a standard curve generated by serial dilution of human genomic DNA (Clontech) or cDNA templates generated from positive control samples in which expression of the target mRNA had been confirmed by conventional PCR techniques, as described above. To control for variation in the input cDNA quantity, expression of the target cytokine mRNA was normalized to GAPDH expression, a housekeeping gene, in the same sample by dividing the quantity of PCR product of interest by the quantity of GAPDH product. Normalized values were either plotted directly, or plotted as relative expression determined by dividing the quantity of PCR product in infected cells by the quantity of PCR product in uninfected controls, using the normalized values. Because viral RNA was transcribed into cDNA using a virus specific primer, normalization to an internal standard (GAPDH) was not performed. Therefore, plotted values represent quantities obtained directly from interpolation from a standard curve generated using cDNA transcribed from 1–2 μg RNA from HRV-39-infected HeLa cells harvested 24 h postinfection when maximum virus titer is present. Quantitation using standard curves described above was also validated using cDNA transcribed from PMA-stimulated human peripheral blood mononuclear cells (to quantitate cytokine mRNA) or cDNA transcribed from partially purified virus (to quantitate viral RNA). Cytotoxic concentrations of the pyridinyl imidazole compounds were assessed in BEAS-2B cultures using a sodium 3′-[1-[(phenylamino)-carbonyl]-3,4-tetrazolium]-bis(4-methoxy-6-nitro)benzene-sulfonic acid hydrate (XTT) cleavage assay (19). Serial 2-fold dilutions of compounds starting at 100 μM were added to BEAS-2B cultures in microplates and incubated for 72 h at 34°C to mimic infection protocols. Bioreduction of XTT to formazan was determined after an additional 3-h incubation at 37°C. Absorbance was read at 450 nm using a Dynex ELISA microplate plate reader. Compounds were tested for antiviral activity using a standard minimum inhibitory concentration assay (20). Twofold dilutions of compound starting at 10 μM were added to 50–100 TCID50 HRV-39 in equal volumes (50 μl each). Dilutions (100 μl each) were added to HeLa cell monolayers cultured in 100 μl media so that final volume per well was 200 μl. Cultures were incubated for 5 days at 34°C until cytopathic effect in virus control wells (no drug) was maximal. Inhibition of cytopathic effect in the presence of compound was assessed by microscopy. For detection of p38 kinase, BEAS-2B cells (4 × 105 cells/well) in BEGM were plated in six-well plates 1 day before infection. One hour before infection, BEGM was removed and cultures were incubated in basal media without growth factors and additives to reduce endogenous levels of activated p38 kinase. Rhinovirus was added at various TCID50/well, and cells were harvested at various time points after the addition of virus. After removal of culture supernatant, cells were lysed directly into SDS sample buffer (62.5 mM Tris-HCl, 2% w/v SDS, 10% glycerol, 50 mM DTT, and 0.1% bromophenol blue). Detection of tyrosine-phosphorylated p38 kinase by immunoblot was analyzed by a commercially available kit according to the manufacturer’s instructions (PhosphoPlus p38 MAPK Ab Kit; New England Biolabs, Beverly, MA). Amounts of p38 kinase phosphorylation were quantitated by fluorimager using ImageQuant software (Molecular Dynamics, Sunnyvale, CA). To confirm active replication of HRV-39 in the BEAS-2B cells, we measured the presence of both infectious virus recovered from supernatant and the presence of viral RNA in infected cells at various times postinfection with 2 × 105 TCID50 HRV-39. Infectious virus, representing unbound inoculum, was detected in virus yield assays 1 h postinfection, but decreased over the next 6 h to ≤ 1.5 TCID50/ml (limit of detection). Virus was again recovered from culture supernatant 24 h postinfection and the titer recovered at each time point progressively increased over successive 24-h culture periods (Fig. 1⇓). Because culture supernatant was replaced with fresh media after each collection period, virus recovered after the second and third day indicated continuous viral shedding throughout the culture period. A similar pattern of virus replication was observed using infected cell lysates, with increasing titers observed 24–72 h postinfection (data not shown). There was no cytopathic effect observed in virus-infected cultures, and culture confluency in uninfected and virus-infected cultures was comparable throughout the 72-h culture period (data not shown). HRV-39 replication in BEAS-2B cells. A, Titers of infectious virus in culture supernatants harvested at various times after infection with HRV-39 are shown (mean ± SD from four experiments; ▨). B, Lines represent corresponding levels of positive-strand vRNA or negative-strand vRNA at various times postinfection, determined by RT-PCR, from a representative experiment. The kinetics of viral RNA synthesis as detected by RT-PCR mirrored the kinetics of virus replication seen in virus yield experiments. Quantitative RT-PCR was performed using cells from the same cultures used to measure virus titer, in which media had been replaced at each time point. Viral RNA, representing adsorbed or internalized inoculum, was detectable 1 h postinfection but levels declined over the next 3–6 h. By 24 h, a significant increase in PCR products derived from both positive- and negative-strand RNA were detected, with levels gradually decreasing over the next two 24-h time periods. However, the continued presence of detectable levels of viral RNA 48–72 h postinfection indicated ongoing viral replication. No PCR products were generated in RT-PCR using RNA extracted from uninfected cells or using cDNA templates and PCR probe in the absence of PCR primers. Viral replication was not detected by either yield experiments or RT-PCR after exposure of the BEAS-2B cells to UV-inactivated virus at any of the time points tested (not shown). The release of IL-8, IL-6, and GM-CSF by BEAS-2B cells in response to rhinovirus infection has been reported previously by several investigators (8, 11, 21). In addition to looking at these factors we also sought to determine whether other chemokines and growth factors important in neutrophil and eosinophil recruitment or activation were elicited by rhinovirus infection. Supernatants from cultures of BEAS-2B cells infected with HRV-39 were harvested at 72 h postinfection and assayed for cytokine protein content by ELISA. The harvest at 72 h was chosen based on preliminary studies using IL-1 or TNF stimulation of BEAS-2B cells, in which cytokine levels continued to accumulate throughout this time period (not shown). As noted above, cell replication (based on culture confluency) was similar in virus-infected and uninfected cultures during this period. In agreement with previously reported data, significant levels of IL-8 (4,950 pg/ml), IL-6 (4,275 pg/ml), and GM-CSF (40 pg/ml) were secreted by BEAS-2B cells in response to rhinovirus infection (Fig. 2⇓). In addition, significant levels of G-CSF (4,307 pg/ml), and the CXC chemokines, GROα (13,022 pg/ml) and ENA-78 (900 pg/ml), were produced by infected cells (Fig. 2⇓). Low levels of IL-1α (15 pg/ml) were also observed in some experiments whereas IL-1β and TNF-α were not produced by infected cells (not shown). Of the mediators tested, GROα was present at the highest endogenous levels in cultures of uninfected cells (2,440 pg/ml). Production of the CC-chemokines eotaxin, eotaxin 2, monocyte chemoattractant protein-3, monocyte chemoattractant protein-4, macrophage inflammatory protein-1α, or RANTES was not detected in culture supernatant from infected cells. Cytokine production by rhinovirus-infected BEAS-2B cells 72 h after infection with HRV-39. Data represent the mean ± SEM cytokine concentration obtained from six experiments in uninfected (▨) and HRV-39-infected (▪) cultures. The time course of mRNA induction and protein secretion for infected cells was analyzed for a subset of the above mediators (IL-8, GROα, G-CSF, and GM-CSF). Conditioned media was collected at indicated time points and replaced with fresh media. RNA was harvested from the same cell culture wells used to measure protein release. A representative experiment is shown in Fig. 3⇓. Secretion of cytokines into the supernatant in response to infection was initially detected by 3–6 h postinfection; however, peak cytokine secretion occurred 48–72 h postinfection. (Fig. 3⇓; bars). The significant release of GROα in uninfected cells evident at the harvest at 72 h is consistent with the presence of high endogenous levels noted in Fig. 2⇑, suggesting that culture conditions (i.e., culture confluency) at this late time point contributed to the overall levels of GROα detected. Time course of induction of cytokine mRNA and protein synthesis for IL-8 (upper left), GROα (upper right), G-CSF (lower left), and GM-CSF (lower right) in response to HRV-39 infection. Bars indicate protein levels (cytokine secreted since previous time point) for uninfected BEAS-2B cells (▧) or HRV-39-infected BEAS-2B cells (▨). Lines represent corresponding cytokine mRNA levels detected at each time point. 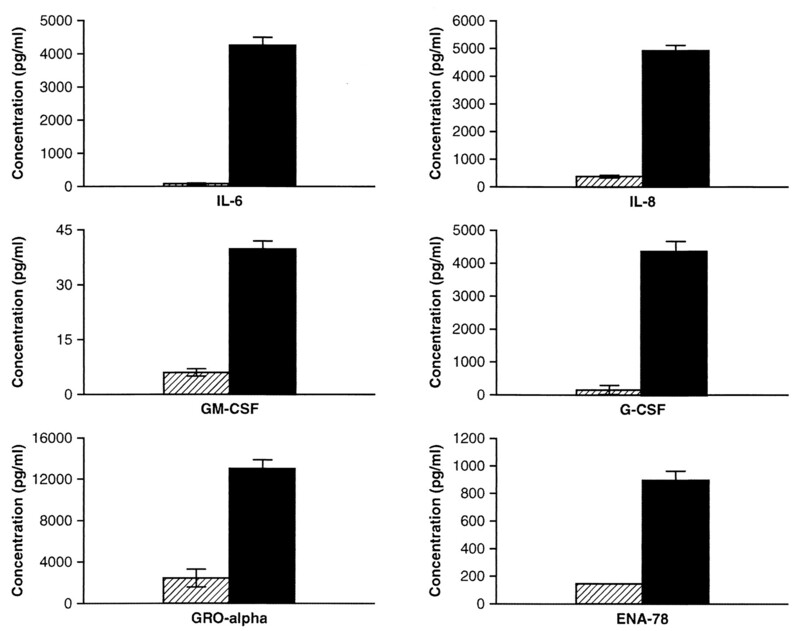 Rhinovirus infection also resulted in substantial increases in mRNA expression for IL-8, GROα, G-CSF, and GM-CSF detectable as early as 1 h postinfection as compared with uninfected control cells (Fig. 3⇑; lines). Of interest, the response appeared biphasic with a second increase in mRNA observed 24–48 h postinfection paralleling the kinetics of vRNA replication, although the magnitude of this second increase in cytokine mRNA varied with different preparations of HRV-39. Cytokine mRNA levels remained elevated compared with uninfected control cells for up to 48–72 h postinfection. To further investigate whether cytokine production was related to virus replication, BEAS-2B cells were incubated for 72 h with UV-inactivated virus, various TCID50 units of infectious virus, or medium alone. As shown in Fig. 4⇓, the cytokine response to infectious virus was dose-dependent. 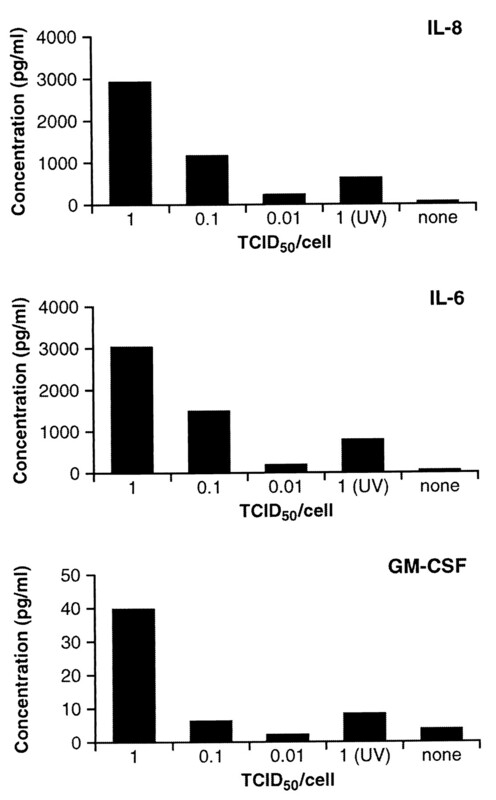 In addition, UV inactivation of virus significantly diminished the ability to stimulate cytokine production at 1 TCID50/cell, although low levels of IL-8, IL-6, and GM-CSF were produced (Fig. 4⇓). These results suggested that replicating virus was required for induction of optimal cytokine responses and that cytokine synthesis was not significantly stimulated by other factors present in the virus preparation. Cytokine release in response to UV-inactivated or infectious HRV-39. Data represents protein concentrations of IL-6 (top), IL-8 (middle), and GM-CSF (bottom) in supernatants from BEAS-2B cells exposed to infectious HRV-39 (1, 0.1, or 0.01 TCID50/cell), UV-inactivated HRV-39 (1 TCID50/cell), or media alone (representative of three experiments). Studies from other laboratories have shown that increased IL-6 cytokine production or adhesion molecule expression by virus-infected epithelial cells was mediated indirectly via induction of IL-1α or IL-1β (12, 22). The apparent biphasic response in mRNA induction in our studies also suggested the possibility of a secondary stimulus. To determine whether induction of low levels of IL-1α, IL-1β, or TNF-α were responsible for the observed increases in cytokine levels in our system, the effect of neutralizing Abs to these cytokines on IL-8 and IL-6 production in response to HRV-39 infection was determined. The presence of neutralizing Abs to IL-1α, IL-1β, and TNF-α had no effect on the level of either IL-8 or IL-6 produced by rhinovirus-infected BEAS-2B cells suggesting that rhinovirus directly stimulated production of these cytokines (data not shown). The role of the p38 kinase signal transduction pathway in rhinovirus-induced cytokine production in epithelial cells was initially tested using the p38 kinase inhibitor, SB 203580 (14, 23). As a control for specificity, SKF 106978, an analogue of SB 203580 devoid of p38 kinase-inhibitory activity, was also tested at the same concentration. BEAS-2B cells that had been preincubated with drug for 30 min were infected with HRV-39 and cytokine concentrations in infected culture supernatants were assessed after 72 h. Compounds were present during the infection period and for the duration of the culture. Treatment of infected cells with SB 203580 (3 μM) resulted in a 34–57% decrease in release of all the mediators tested (IL-8, GRO, G-CSF, IL-6, GM-CSF, and ENA-78). SKF 106978 had minimal effect on cytokine production (Table II⇓), which was similar to the effect seen with the addition of DMSO alone (0.03%; not shown). SB 203580 has previously been shown to be >1000-fold selective for p38 kinase vs a panel of protein kinases including JNK1, ERK2, Mek-1, Cdc2, protein kinase A, protein kinase C-β2, TGF-βI and IIβ, MAPKAP2, LCK, and epidermal growth factor receptor tyrosine kinase (14). However, SB 203580 demonstrated only a 10-fold selectivity ratio against the related c-raf (IC50 of 48 nM vs 280 nM, respectively; Ref. 14). Therefore, we confirmed our results with a second inhibitor of p38 kinase activity, SB 239063, which demonstrated potency comparable to SB 203580 in enzyme inhibition assays (IC50 of 44 nM) but did not exhibit activity against c-raf (IC50 > 50,000 nM; Ref. 24). SB 239063 also demonstrated greater selectivity against several of the other protein kinases such as LCK, Cdc2, and epidermal growth factor receptor tyrosine kinase when compared directly to SB 203580 (data not shown). Despite comparable activity in cell-free enzyme inhibition assays, SB 239063 treatment of HRV-infected BEAS-2B cells resulted in 76–100% inhibition of cytokine secretion vs 34–57% inhibition observed with SB 203580 (3 μM; Table III⇓ vs Table II⇑). Of note, cytokine levels were higher in the series of experiments in which SB 203580 had been tested. As shown in Table III⇓, the dose responses for inhibition by SB 239063 were similar for most of the cytokines or chemokines tested (approximate IC50s of 3–30 nM). Inhibition of GROα secretion in response to HRV-39 infection required the highest SB 239063 concentration (IC50 of 300 nM). Collectively these results provide strong evidence that the inflammatory cytokine response to HRV-39 infection is primarily mediated through the p38 kinase signal transduction pathway. The inhibition of cytokine production by p38 kinase inhibitors was not due to general cell cytotoxicity as determined by standard XTT assays (CC50 > 70 μM for either compound). These compounds also did not exhibit direct antiviral activity as assessed using a standard HeLa cell antiviral assay (MIC50 > 10 μM for either compound) or by measuring virus yield in the rhinovirus-infected BEAS-2B cultures directly (results not shown). To confirm that the p38 kinase was involved directly in cell activation after infection with rhinovirus, we measured the presence of tyrosine-phosphorylated p38 kinase by immunoblot at various times after the addition of HRV-39 to BEAS-2B cultures. IL-1-stimulated cells were used as a positive control and p38 activation was demonstrated within 15 min posttreatment (Fig. 5⇓A). HRV-39 infection of BEAS-2B cells also resulted in an increase in phosphorylated p38 kinase, which was both dose and time dependent. Increases in phosphorylated p38 kinase were evident by 15 min postexposure to HRV-39, appeared to peak by 30 min, and remained elevated 60 min postinfection (Fig. 5⇓A). In addition, rhinovirus-induced tyrosine phosphorylation of p38 kinase was dose dependent (Fig. 5⇓B). When cells were cultured in the absence of virus, there was no increase in the amount of tyrosine phosphorylation of p38 kinase at any of the time points tested (Fig. 5⇓A, control). Overall levels of p38 kinase protein were comparable between all the groups indicating that virus infection caused phosphorylation of p38 kinase without de novo synthesis of protein (Fig. 5⇓). p38 kinase activation in response to HRV-39 infection. A, Time course of p38 kinase activation in BEAS-2B cells incubated with 25 ng/ml HRV-39 or IL-1β. 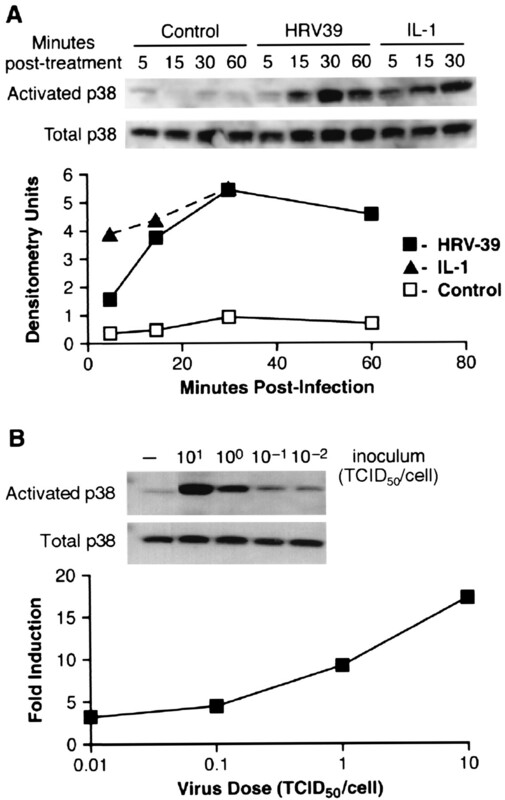 B, Dose-dependent activation of p38 kinase in BEAS-2B cells incubated with HRV-39 for 30 min. Western blots of tyrosine-phosphorylated vs total p38 kinase are shown in top two panels. Bottom panels indicate densitometer volumes from control BEAS-2B cells, HRV-39 infected cells, or cells treated with IL-1β (A) or densitometic ratios of infected vs uninfected BEAS-2B cells (B; fold increase). Results from representative experiments are shown (n = 3). Studies reported previously indicated that the pyridinyl imidazole compounds inhibit p38 kinase enzyme activity through competition with ATP (25). Consistent with this mechanism of action, SB 239063 had no effect on the level of tyrosine phosphorylation of the p38 kinase in BEAS-2B cells in response to HRV-39 infection suggesting that this compound affected the enzymatic activity of the p38 kinase rather than its activation (Fig. 6⇓). Effect of SB 239063 on tyrosine phosphorylation of p38 kinase in response to HRV-39 infection. Western blot (top panels) or densitometric ratios (bottom panel) showing amount of activated p38 kinase in untreated HRV-39 infected cells (▪) or infected cells treated with SB 239063 (▨) vs untreated uninfected cells. Representative experiment (n = 2). To further evaluate the effect of p38 kinase on HRV-induced cytokine production, we also wanted to determine whether inhibitors of p38 kinase regulated cytokine production at the level of mRNA transcription. In these studies, SB 239063 was used to treat cells and IL-8 mRNA levels were assessed. Cytokine mRNA expression was examined 1, 3, 6, 24, and 48 h postinfection in untreated infected BEAS-2B cells or in infected cells treated with 3 μM SB 239063. HRV-induced IL-8 mRNA up-regulation was only partially inhibited in cells treated with SB 239063 (Fig. 7⇓). These data were reproducible in three experiments. IL-8 mRNA expression in BEAS-2B cells infected with HRV-39 and cultured in the presence or absence of 3 μM SB 239063. Results are expressed as increase in mRNA levels as compared with untreated uninfected cells after normalization to GAPDH. Results are representative of three experiments. Rhinovirus infection, as well as infection with other respiratory viruses, has been shown to stimulate production of IL-6, IL-8, and GM-CSF in nasal secretions of infected individuals and in cultures of primary respiratory epithelial cells or in human repiratory epithelial cell lines (7, 8, 10, 11). IL-8 is thought to be primarily responsible for the neutrophil infiltration that is evident early after natural or experimental rhinovirus infection (7, 11). The objective of this study was to further characterize the chemokine response to rhinovirus infection using the BEAS-2B bronchial epithelial cell culture system. p38 MAP kinase signal transduction pathway has been implicated in cytokine elaboration by multiple cell types in response to various inflammatory stimuli (reviewed in Refs. 14 and 26). Therefore, we investigated the role of this pathway in rhinovirus-induced cytokine production. This study is the first to demonstrate that GROα, ENA-78, and G-CSF, factors important in the recruitment and activation of neutrophils, are induced in the bronchial epithelial cell line, BEAS-2B, upon active infection with rhinovirus. Consistent with previous reports we were also able to demonstrate dose and time-dependent increases in cytokine mRNA expression and protein secretion of IL-8, IL-6, and GM-CSF (8, 10, 11). The level of protein induction in BEAS-2B cells in response to rhinovirus infection was comparable for each of the mediators tested (5- to 7-fold), although GROα was produced at the highest levels endogenously by uninfected cells (Table II⇑, Fig. 1⇑). Cytokine mRNA accumulation initially peaked 1–6 h postinfection. A second increase in cytokine mRNA was observed 24–48 h postinfection, although the magnitude of the second signal varied between different preparations of the virus. Cytokine mRNA levels remained elevated compared with uninfected cells up to 72 h postinfection, consistent with the continued release of cytokine observed 48–72 h postinfection in these studies. The kinetics of cytokine secretion in our studies differed from those described in earlier reports using BEAS-2B cells (8, 21) in which significant cytokine release was evident before 24 h. In the present study, low but detectable levels of cytokine were present 3 to 6 h postinfection, consistent with the early increase in mRNA accumulation, but peak protein secretion occurred 48–72 h postinfection. In studies by Zhu et al. (11), the kinetics and levels of IL-8 produced in response to HRV infection differed among A549, MRC-5, and normal human bronchial epithelial cells. However, IL-8 protein levels continued to increase with continued cell culture up to 48–96 h postinfection. These data are consistent with the kinetics of cytokine secretion in HRV-infected BEAS-2B cells in the present study. HRV infection of primary bronchial epithelial cells induced production of RANTES in culture supernatants (27). RANTES, as well as GROα, was also produced in A549 cells in response to HRV infection (28). However, we were routinely unable to detect RANTES production in response to rhinovirus. The reason for these differences is unclear but may be attributed to differences in virus preparations (host cell, purification, virus strain, etc. ), cell type, or culture conditions used by different investigators. Similar to our observations in HRV-infected BEAS-2B cells, Fiedler et al. (29) reported a biphasic accumulation of IL-8 mRNA in RSV-infected A549 cells. The early response was observed in cultures inoculated with nonreplicative virus, whereas the late response was dependent on viral protein synthesis and viral replication (29). Thus, the early peak in HRV-induced transcript accumulation in the present study was possibly due to early stages of virus-cell interactions such as binding and/or internalization. The second peak in mRNA 24 h postinfection corresponded to HRV replication as measured by either virus yield or quantitation of viral RNA in infected cells. Increased cytokine mRNA levels at this later time point could be due to a direct effect of the virus or viral proteins on transcription or an indirect effect mediated by double-stranded RNA intermediates formed during virus replication (30, 31). The presence of a second increase in mRNA 24 h postinfection also suggested the possibility of a secondary stimulus. Neutralizing Abs to IL-1 (α and/or β) have been shown to inhibit HRV-14-induced ICAM-1 up-regulation in human tracheal epithelial cells and to inhibit IL-6 production in RSV-infected A549 cells. This suggests that virus infection of epithelial cells could indirectly up-regulate surface ICAM-1 expression or cytokine release via induction of IL-1 (12, 22). However, neutralizing Abs to IL-1α, IL-1β or TNF had no effect on the overall levels of IL-8 and IL-6 achieved in response to HRV-39 infection in our experiments. Signal transduction pathways responsible for rhinovirus-induced cytokine induction have yet to be elucidated. Several recent studies have demonstrated a role for p38 kinase in viral-host interactions. The herpes simplex virus type 1 transactivator protein, VP16, activates both JNK and p38 kinase, with maximum stimulation of p38 kinase occurring 9 h postinfection (32). The EBV-encoded latent membrane protein 1 was shown to regulate IL-6 and IL-8 production through activation of p38 kinase (33). A role for MAP kinases in respiratory virus infection has recently been demonstrated in a study by Kujime et al. (34) in which p38 MAP kinase and c-Jun-NH2-terminal kinase were shown to regulate RANTES production in influenza virus-infected bronchial epithelial cells. In addition, Chen et al. (35) demonstrated that IL-8 production by RSV-infected A549 cells was linked to activation of ERK2 kinase. In this study we demonstrated that the p38 MAP kinase signal transduction pathway plays an important role in HRV-induced cytokine biosynthesis in BEAS-2B cells. Activation of MAP kinases can be induced by early stages of viral infection such as viral binding and internalization as was shown with simian immunodeficiency virus activation of ERK1/2, p38 kinase, and JNK as well as ERK2 activation by RSV infection of A549 cells (35, 36). Alternatively, MAP kinase activation can require viral protein synthesis or replication as was demonstrated with herpes simplex virus or EBV activation of JNK and p38 kinase (32, 33). In our studies, short exposure (5 min) of cells to HRV resulted in phosphorylation of p38 kinase in a virus dose-dependent manner. The data suggested that a direct interaction of rhinovirus with cultured epithelial cells was responsible for activation of p38 kinase and that virus replication or viral protein synthesis was not required. These results differed from the delayed activation of p38 kinase demonstrated in response to influenza infection in NCI-H292 bronchial epithelial cells (peak activation at 6 h postinfection; Ref. 34). The functional significance of this p38 kinase activation was demonstrated by the reduction in rhinovirus-induced cytokine (IL-6, GM-CSF, and G-CSF) and chemokine (IL-8, GROα, and ENA-78) secretion observed in cultures of infected BEAS-2B cells treated with selective inhibitors of p38 kinase, SB 203580 and SB 239063 (14, 23, 24). Replication of rhinovirus in BEAS-2B cultures was not affected by treatment with p38 kinase inhibitors providing additional evidence that p38 kinase activation is directly involved in cytokine regulation in infected cells. This is the first demonstration of inhibition of G-CSF and GROα production by p38 kinase inhibitors indicating that production of these factors in epithelial cells is also regulated by p38 kinase. The involvement of the p38 MAP kinase pathway in AP-1 regulation is well documented, and more recently the JNK/p38 MAP kinase pathway was implicated in the activation of NF-κB (37, 38, 39). The role of the NF-κB transcription factor in HRV-induced IL-8 and IL-6 biosynthesis in airway epithelial cells, as well as ICAM-1 and VCAM-1 adhesion molecule expression, is well documented (10, 11, 13, 40). Therefore, stimulation of the p38 MAP kinase pathway may be at least partially responsible for the activation of the NF-κB transcription pathway in epithelial cells in response to rhinovirus infection. Alternatively, p38 kinase may mediate its effect in HRV-infected cells via posttranscriptional mechanisms. For example, VCAM-1 expression in endothelial cells and TNF production by LPS- or cytokine-stimulated monocytes are regulated posttranscriptionally (41, 42). Our data (Fig. 7⇑) support this latter hypothesis. The early peak in cytokine mRNA levels 1–6 h post-HRV infection followed the early activation of p38 kinase. However, despite an 80% reduction in total protein secretion in HRV-infected BEAS-2B cell cultures treated with 3 μM SB 239063, there was a trend for a decrease in IL-8 mRNA levels, which was not considered significant (Fig. 7⇑). Importantly, the peak in IL-8 mRNA levels 3 h postinfection was not affected and overall levels in the presence of SB 239063 still represented a significant up-regulation in mRNA as compared with uninfected cells. Similarly, inhibition of ERK2 kinase activation in RSV-infected A549 cells by treatment with the MEK1 inhibitor PD98059 also resulted in decreased IL-8 protein production while having no significant effect on mRNA levels (33). The prolonged kinetics of cytokine secretion suggest that p38 kinase activation may be sustained in BEAS-2B cells in response to rhinovirus infection. In preliminary kinetic experiments, addition of p38 kinase inhibitors up to 4 h postinfection did not affect the ability of these compounds to inhibit cytokine production whereas the compounds were only partially effective when added at 24 h (S.G., unpublished observations). These experiments do suggest that activation of p38 kinase is sustained for at least several hours postinfection. One possible mechanism of continued stimulation at later times is the release of new virus 24–72 h following infection and initiation of a new infection cycle. Also, although IL-1 and TNF do not appear to be important secondary stimuli, we cannot rule out that other factors released in response to infection could play a role at later time points. Finally, investigators recently showed that human cytomegalovirus infection activated p38 kinase through two distinct mechanisms at different stages of the infectious cycle (43). Initially, human cytomegalovirus activated p38 kinase through inhibition of dephosphorylation thereby interrupting steady-state regulation. At later time points, there was an increase in activity of an enzyme known to phosphorylate p38 kinase, MKK3/6. Although unlikely that an RNA virus would have evolved similar complicated mechanisms for host/cell interactions, a dual mechanism of p38 kinase activation by rhinovirus is possible. Additional kinetic studies of both p38 kinase activation and inhibitor addition will provide insight into the mechanism by which p38 kinase modulates HRV-induced cytokine production in BEAS-2B cells. In summary, we have demonstrated that multiple cytokines (GM-CSF and G-CSF) and CXC chemokines (IL-8, ENA-78, and GROα) that specifically support neutrophil proliferation, infiltration, and activation are produced by BEAS-2B bronchial epithelial cells in response to rhinovirus infection. The data suggest that these mediators may collectively be responsible for the early neutrophil infiltration and activation associated with rhinovirus infection. In addition, these studies identified a role for the p38 kinase signal transduction pathway in rhinovirus-induced cytokine elaboration. These results suggest that inhibition of p38 kinase may be a new strategy for the treatment of neutrophil-mediated pathogenesis and inflammation associated with rhinovirus infection. We acknowledge the enthusiastic technical assistance of Lauren Kaskiel. ↵1 This work was presented in part by Sandra D. Griego, Cynthia Weston, Jerry L. Adams, and Susan B. Dillon at the American Thoracic Society’s 96th International Conference, May 5–10, 2000, in Toronto, Ontario, Canada (Abstract 127622-A). ↵3 Abbreviations used in this paper: HRV, human rhinovirus; MAP, mitogen-activated protein; ERK, extracellular signal-regulated kinase; JNK, c-Jun N-terminal kinase; BEGM, bronchial epithelial growth media; HRV-39, rhinovirus serotype 39; TCID50, tissue culture-infective dose of virus required to infect 50% of monolayers; RSV, respiratory syncytial virus; GROα, growth-related oncogene-α; ENA-78, epithelial neutrophil-activating protein-78; RT, reverse transcriptase; XTT, sodium-3′-[1-(phenylamino)-carbonyl]-3,4-tetrazolium]-bis(4-methoxy-6-nitro) benzene-sulfonic acid hydrate; SB 239063, trans-1-(4-hydroxycyclohexyl)-4-(4-fluorophenyl)-5-(2-methoxypyridimidin-4-yl)imidazole; SB 203580, 4-(4-fluorophenyl)-2-(4-methylsulfinylphenyl)-5-(4-pyridyl)imidazole; SKF 106978, 2-(4-methylsulfinyl)-3-(4-(2-methylpyridyl))-6,7-dihydro(5H)pyrrolo(1,2-a)imidazole.